Balancing your daily work life with staying active and healthy can be difficult, primarily if you work from home, where your personal and work life can start to blend. Working a full-time job doesn’t leave you much time to hit the gym as often as you’d like. If you’re struggling to get enough exercise, or are looking to be more active during the day, then a simple solution could be to purchase a treadmill desk. They’re a fantastic way to get the most out of your workday, allowing you to achieve maximum productivity by combining work with staying active and burning extra calories. 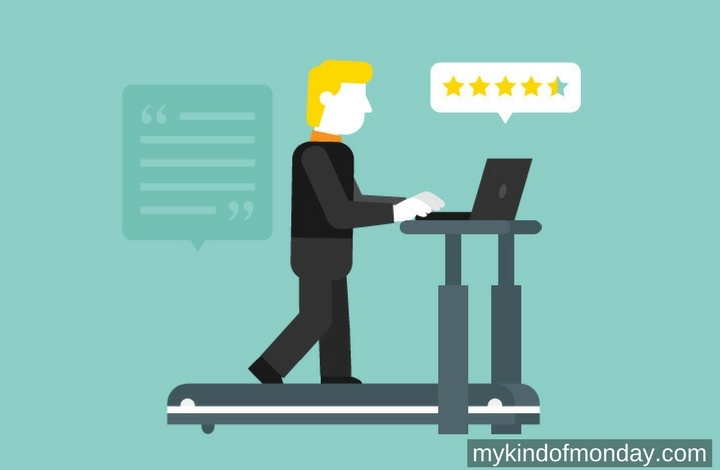 If you’re looking to make the switch to a treadmill desk, or even looking to upgrade the one you currently have, here’s our list of the best treadmill desk reviews with a range of designs and features to suit your budget and your needs. With this product, you’ll have full control of your movements without needing a lot of desk space. The desk can be tailored to your specific needs, and with speeds between 2 and 4 mph, all users will be able to walk at their preferred pace. A more high-tech option, with integrated Bluetooth and Intelli-Step technology, which detects your footsteps, and will only operate the treadmill once you’re ready. Your walking progress can be tracked on your smartphone, helping you stay motivated, and the data in the console will sync effortlessly with any other devices. All your accessories and the desks controls are within your reach, while your body is positioned to work on a computer comfortably. Despite the fact that you can fold up the treadmill desk when you’re not using it, it’s surprisingly sturdy. The premium steel frame and height-adjustable desk support legs are built to last. This stand-alone treadmill is designed to fit under your desk, and it’s super straightforward to set up. The design is smart and user-friendly and crafted with attention to detail. Some of the benefits of this treadmill include the workout feedback, great warranty and the ability to adjust the height of the desk. The height adjustment means that anyone between 4’8” and 6’8” can use this treadmill desk comfortably. This device will give you workout feedback, so you can stay motivated knowing how far you walked, how many calories you burnt and your step total for the day. A final standout feature on this treadmill desk is its range of speed, which goes from 0.4 to 4.0 mph, considered the ideal speed range for working while walking. The LifeSpan TR1200-DT5 was the clear winner, being the most efficient product and the best for its intended use. The treadmill desk was easy to assemble, and the size of the desk lets you have everything within reach, and therefore stay productive while walking on the treadmill. Its sleek design and safety features allow you to have full control of the device throughout your working day. If you are planning on sharing your treadmill desk with anyone else, this is the device for you. Adjusting the height is done by just the press of a button. The console is integrated into the armrest and out of your way, optimizing the amount of workspace on your desk. Its large desktop will give you the option of a big working area, as well as extra room to store any office supplies. The five-digit and newly designed console in the center of the armrest will give you the option to set your preferred speed, switch measuring units, silence any alerts or beeps and resume your previous pace. Bluetooth integration will send data straight to your phone, as well as readouts for walking distance and time, average speed, steps, and calories burned. The LifeSpan TR1200-DT7 is the treadmill desk for you if you are in the market for a product with a broad range of technology options. The combination of an office treadmill with a broad and adjustable office desk gives you what you need to start walking during your work hours. This is a standalone desk which will fit over most standard treadmills, encouraging you to slowly walk while conducting your daily office tasks. The large workspace area means you’ll have lots of rooms for your laptop, along with your office documents and other assorted necessities. The beveled edges enhance the appearance of this product, and its metal support arms can take up to 55lbs of weight. The TrekDesk has been designed to be used by a wide variety of people, as it accommodates many different sizes. Its adjustable legs can fit a person between 5’4” and 6’4”, which means that you can most likely adjust this desk to suit your height. This treadmill desk was originally designed for office workers, with its features built to help employees complete their work throughout the day and be more efficient. If you need a lot of room for your things, this machine is excellent, as the accessories include a manuscript holder, dedicated accessory slots, two cup holders and a top stand for your electronic devices. Get the ultimate workplace workout when combining this stand-alone treadmill base with any standing desk. This product only includes the treadmill, not the standing desk, which means setting it up is a breeze. This under-desk treadmill was designed to be user-friendly and with considerable attention to detail. If your office space is small, you’ll appreciate the slim and compact design. The small console to control your treadmill can sit at the top of your desk, and keep track of distance, speed and time while you’re walking. There’s no need to worry about beeps and alerts interrupting any conference call, as you can turn the sound on and off. This is the most straightforward setup of all of the best treadmill desks, as it comes fully assembled. You just need to take the treadmill out of the box, roll it into place under your standing desk using the front wheels, turn on the console and that’s it! This easily portable treadmill can come with you wherever you go, and it can be easily maneuvered due to its lightweight frame and front wheels. Perfect if you have a good standing desk that you don’t want to get rid of. The large desktop surface area will give you plenty of space for your laptop, papers, folders, books, etc., and it even comes with a cup holder for your coffee. While some treadmills have a weight capacity of 250 lbs, the Exerpeutic 2000 Workfit Desk can hold exercisers of up to 400 pounds. Another benefit is that the speeds vary from 0.4 to 4.0 mph, and the desk has an AC outlet station and a hole for AC cords, meaning no more tangles in your desk or wires getting in the way. You can incline the desk surface at four different angles, meaning you can write or even draw while walking. And if not in use, you can flip down the desktop surface, therefore converting this device into a regular treadmill. The blue-lit and high-intensity LCD window will give you all the stats needed to stay motivated, such as distance walked, the total amount of steps, average speeds, etc. As an added bonus, the armrests are ergonomic foam, cutting down on wrist pain and decreasing the chance of developing carpal tunnel syndrome. If budget is less of a concern, then we recommend going for the top range model, the LifeSpan Fitness TR800-DT5 Treadmill Desktop which is fully adjustable. However, this treadmill is worth your consideration, as most problems tend to stem from height-related issues. A lot of devices on the market promise both functionality and efficiency, and while this treadmill desk is no different, it definitely delivers on its promise. This feature-packed machine won’t blow your budget, and comes with a built-in step counter, speeds up to 4 mph and is Bluetooth enabled, encouraging its user to be as productive as possible. In our opinion, some of the best features are its top-of-the-line digital LED display, height controls, and wireless capability. If you are looking to really improve your fitness level, this is the treadmill desk for you. You get a free membership to the Lifespan Fitness app, which includes online fitness management and health programs, as well as the ability to track distance, traveled, steps taken, and calories burned and compare them to other users. You can set your fitness goals, track your progress and celebrate any achievements on the app. The workspace is large enough to hold your essentials, including your laptop, water bottle, and small devices, yet small enough not to be cumbersome or bulky. You can adjust the height of your desk, which is necessary for aligning your spine and wrists, as well as proper ergonomic support, making it a fantastic option if you suffer from carpal tunnel syndrome or sciatica. This device is excellent if you want to incorporate physical activity into work and reach your fitness goals, as the app will help you measure and achieve those goals more quickly. If you are looking to improve your physical fitness, repair the damage of oversitting and enjoy productivity and fitness, the TR-800 DT5 is the machine for you. Treadmill desks were created for people that are looking to add more movement to their day. Instead of sitting in a chair for at least eight hours, you stay mobile by walking while using your desk. Sitting down for long periods of time is conducive to weight gain and obesity, so reducing the amount of time you’re sitting down and developing a habit of walking while working is a great way to burn more calories during the day. They differ from treadmills as they are not designed to run at high speeds, but let the user walk at a slow pace for a couple of hours at a time. A treadmill desk is a superb way to get in shape while you work. Since treadmill desks have an average speed of around 2 mph, you won’t get winded or sweaty, but your heart rate will increase and you will still avoid the dangers associated with sitting for extended periods. These risks include type 2 diabetes, heart disease, cancer and early death. A treadmill desk may be a big investment, but there are several benefits that make it worth the money. Out of all the existing exercise equipment for desk jobs, this one offers plenty of versatility and encourages lots of movement. You may be walking at a slow pace, but that doesn’t mean you aren’t burning any calories. Walking at an average speed of 1 mph for an hour will burn around 200 calories, which translates to approximately 1600 calories per day. Combined with a healthy diet, the use of a treadmill desk is an excellent way to lose weight. 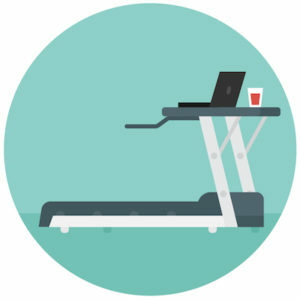 Other health benefits of using a treadmill desk include reduced pain in your lower back and joints from prolonged sitting, reduced blood pressure, increased energy, improved productivity, higher satisfaction, and less stress and boredom. Having a treadmill desk will allow you to get in cardiovascular exercise while going about your daily tasks. There’s no need to schedule frequent gym visits or to sacrifice your lunch hour driving to the gym; you can use your extra time to run errands or spend more time with your friends and family. While working at a treadmill desk, you will be able to multitask while you’re walking. The average speed of a treadmill desk will be around 2 mph, so you’ll still be able to type, read, or talk on the phone with minimal interruption. Whether you’re married, single, if you have children or you don’t, having the right work-life balance is a challenge for all of us. With a treadmill desk, you can use your working hours to exercise, without having to sacrifice your free time. Purchasing a treadmill desk is a significant investment, so there are some things you need to consider before making your final decision. The type of desk, cost, features, and cost are some of the considerations to keep in mind before making your purchase. One of the first considerations you need to have is the size of the treadmill desk. You need to know precisely how much room you have to work with, so measure your office space before starting your research. Another important thing you should do is to measure your stride, as you want the treadmill belt to be long enough to be comfortable. You can choose from several treadmill desk options, including a stand-alone desk or an integrated one. A stand-alone is a walking belt you can place under your desk, while an integrated desk will have a desk surface and a walking belt built into one. Depending on your needs, each type can have its pros and cons. An integrated treadmill desk will make your work-life more manageable, though you may need more desk space than it provides. A standalone is a space saver, but the belt may not be long enough for your stride, and an integrated desk may be too bulky. One of the main reasons for purchasing a treadmill desk is so you can work while walking, and therefore improving your health. If the desk is too small on your integrated treadmill, it will end up gathering dust in a corner, as it won’t be used for working. When considering a desk treadmill, measure your current desk and consider those measurements. The level of assembly for your treadmill desk should be minimal to practically non-existent. If you choose a stand-alone treadmill, minimum construction time should be needed. For integrated treadmill desks, you may need to expend a bit more effort, but whatever you choose, you should feel confident that you can assemble the machinery on your own with the instructions provided. Be sure to take into consideration the offered warranty on your preferred treadmill desk. The manufacturer should provide at least a years warranty, including parts and labor. Some manufacturers provide additional warranty, which you may want to consider if you know that your treadmill desk will be in constant use.